now that's mad love for you! harley looks like a zombie of love like in warm bodies. All the yes! Every last drop! Excellent! 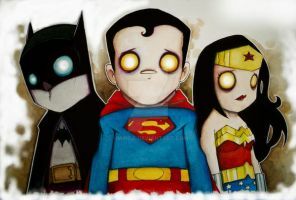 Its cute in a creepy way and I like it! Great job! 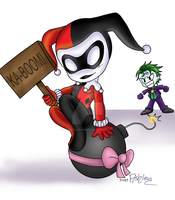 haha Harley's all "Can I kill em, puddin'? " This is just too adorable...! Lil Harley Quin is so cute. I feel like the Joker is kind of Joker/the Penguin with his nose all pointy. And Harley looks like a voodoo doll or a marionette. I love the colours, I love the whole thing! Love it! Shes the perfect little henchperson here, and you captured his personality fantastically. 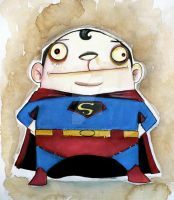 omg, Harley looks super cute..
OOOOOOW!i love them both!may be they are my mos favourite characteres! man,this is awesome dig the joker's-smile! 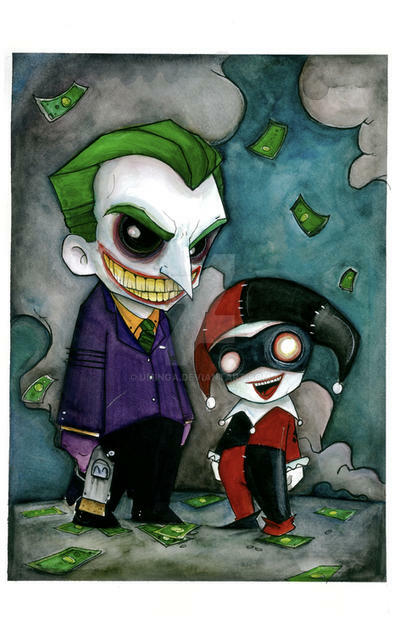 this typa art fits joker n harley perfectly! Quinn looks too cute. amazing. this is pretty much the cutest picture EVER!!!! I enjoy how they look like dolls over people. I love how you captured their unreal-ness with the playful-ness of the characters. Thank you for making this. It's really awesome. I remember my GF getting this poster for me. This is such an awesome image. Whoa, cool! Love those creepy teeth. I love the late '90's batman!! that's rawkin. I really like the grins. I am glowing with happiness right now! So cute! I love how Harley is little compared to the Joker! They look like they're having so much fun...sigh. I also can't staring at the smoke in the bacground...really nice colouring job here!